Paradise Gardens II, is a lovely two pool mature development, situated close to all amenities Kato Paphos has to offer. The Harbour and down town Kato Paphos are just 10 minutes away on foot, with all the varied activities availability both night and day. Ping's Paradise is a two bedroom, with one and a half bathrooms. The property is fully air conditioned for the summer and a log burner for the winter. Down Stairs, there is a fully fitted kitchen with fridge freezer, oven, hob, washing machine, dishwasher and microwave etc, along with the down stairs WC. The main living and dining area is open plan, complete with leather sofas, dining table for six, TV and DVD player, a water chiller and wood burner. The double patio doors open out on to an extensive private paved seating area, complete with sun loungers, outdoor dining furniture and BBQ (Gas not included). The garden offers access to the communal areas and the pools. To the front is a private drive with parking. Open plan stairs lead to the upstairs landing, with two large airy bedrooms both having their own direct access to a full length balcony over looking the complex gardens and the pool area. The bedrooms are fitted with both air conditioning and remote control ceiling fans. The family bathroom / shower room is also located off the landing. The house is also fitted with shutters to keep it cool and secure. We are a very active couple with wide interests in life. Having been working in abroad for last decade we want to have a holiday home in a sunny place to relax and enjoy our life more. We fell in love with this pretty double fronted house immediately when we saw it on Right Move. Paradise Gardens in a 10 minutes walking distance from Kato Paphos seafront, which is very pleasant harbour with plenty restaurants shops and bars. The healthy climate and natural beauty combined with an abundance of activities and interests make the whole area an ideal holiday destination. With only 15 minutes away by car there are many main airlines flying from and to Paphos Airport connecting to a few main UK cities and other part of the world. The appartment is well equipped, in a very nice garden. 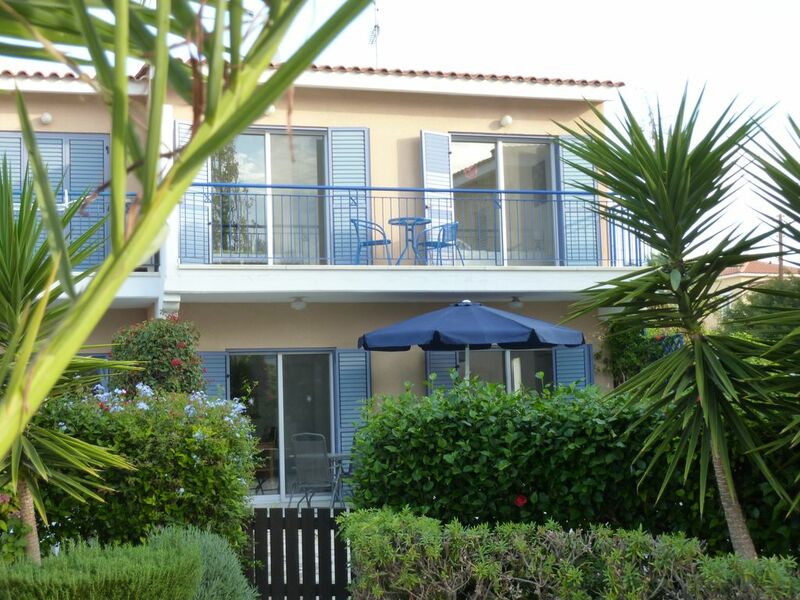 Clean and comfortable for 4 persons, 15’ walk to beach and restaurants. Paphos has lovely sandy beaches, Coral Bay is the most popular one 15 min. drive. Location was great, hired a car so went to the archeological locations and also up to Coral bay beach, our favourite. Perfect size and everything you need to hand. Quiet mature garden setting with great pool.